Naturopathic doctors say that your skin is a reflection of what is going on inside your body. If you suffer with spots, sores, rashes, eczema, psoriasis, boil, acne, itchy or scaly skin then you are likely to benefit from a skin detox. The skin is the largest organ of detoxification and skin problems are often a sign that the body is overloaded. When the other detox organs cannot cope the skin tries to compensate and excretes the toxins resulting in skin problems. The first thing to do is a basic detox. Avoid sugar and foods containing it, fatty and fried foods, processed and junk food, margarine, hydrogenated fats, wheat, and dairy products. alcohol and coffee. Saturated fats promote inflammation of the skin. Eat plenty of fresh fruit, vegetables, salads,low mercury fish, lean grass fed meat, whole grains, beans and seeds. Researchers have discovered that yellow pigments, or carotenoids in fruit and vegetables such as carrots, tomatoes, pumpkins, plums, oranges and dark leafy greens play a crucial role in producing a healthy skin with a golden glow. These pigments are antioxidants which help mop up free radicals that cause skin aging. Eating a high fiber diet like this will help keep the colon clean which helps to keep the skin clean and looking good. Drink at least 6 glasses of pure water each day. Fresh vegetable juices can help with cleansing the skin. Here’s a particularly good skin cleansing juice recipe. Mix together and drink 2 or 3 times a day. Drink herbal teas such as dandelion and Pau D’arco. The skin is the largest organ of absorption as well as the largest organ of detox. It will absorb all the chemicals, artificial perfumes and scents from personal care products and cosmetics which will overload the liver detox pathways. Use only natural and organic products on your skin. Remove as many toxic products from both inside and outside your home. A toxin free place to live is essential for detoxification and to stay healthy after detox. Use natural products for cleaning and ecological paints. Look for companies who clean carpets with non toxic methods. Skin brushing is important for a skin detox. Old, dying skin cells are sloughed off every and they are replaced with new cells. day. Brushing your skin with a dry natural bristle brush helps to remove the old top layer of skin. Brushing your skin everyday helps with blood and lymph circulation which will aid detoxification. Follow with a shower fitted with a shower filter. If the basic detox methods above do not improve your skin enough you will need to do some deeper organ cleansing. Start with a colon cleanse and then do a liver detox. If that does not solve your problem then try a kidney cleanse and lymph detox. Stress, hormone imbalance, poor diet and nutrient deficiencies all affect the health of your skin. Fortunately your skin can renew itself and a skin detox can work wonders to improve all sorts of skin problems. 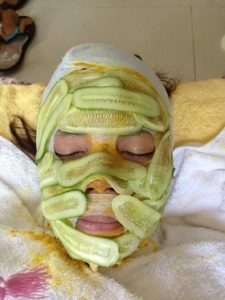 A skin detox, I love it! I have always heard of people discussing a natural body detox. The skin is the largest organ of the body, so caring for it the way you have suggested makes perfect sense. I’ve found that drinking waters is SOOOOO underrated. There have been a few times in my life where my main source of water was work or somethign like that, and so I wouldn’t get much just regular water on the weekends. I noticed huge differences in my skin health vs times when I could drink water all day every day. It’s great that you noticed the difference. You can apply all sorts of hydrating creams to your skin but it needs to be treated from the inside out as well. Wheat, eggs and dairy products are common food allergies for eczema sufferers but any food could be involved. Even though you eat a good diet you could be eating something that you are allergic or intolerant to. You could see a dramatic improvement in the eczema when you do a detox. In your case it would be a good idea to add one food back at a time after the detox to see what effect it has on the eczema. When I cut wheat and dairy out of my son’s diet his eczema cleared up. I could drink more water: that’s one of the harder habits for me. I need to be more consistent about bringing a sports water bottle around with me. It’s also hard to find a truly natural moisturizer. Coconut oil works and I use it for my body, but I prefer something else for my face. Just trying a new moisturizer I found at my food co-op, it’s based on shea butter and has no parabens or other weird ingredients. Making sure you drink enough pure water every day is good but make sure your water bottle is non-toxic. Many of the sports bottles are made of plastics and the chemicals leach into the water of time when they are reused. As for your moisturizer I have recently discovered Green Organics fantastic range of skin care products. http://www.GreenOrganicsHealthAndWealth.com . You can get them at wholesale price when you sign up as a preferred customer. Drinking plenty of water is an obvious solution that many people, don’t seem to understand the importance of. I like the fact that you mention removing the dead skin cells as well, that is something that I wouldn’t have thought of being so important. By all means quote away provided you credit me with the articles with a link back to them.